Catch the Virginia Beach Trolley...The "Wave"
Catch the Virginia Beach Trolley - The "Wave"
"Catch the Wave" -- the Virginia Beach Trolley-- and you'll feel like you've stepped right in the neighborhood. Riding this little slice of nostalgia is a fun and inexpensive way to sightsee and make your way around the beach area. Kids will love a ride on the Wave just for the fun of it. Our fondest memory of the Wave? When my brother-in-law got married, they rented the one of the old-fashioned trolleys to transport the wedding party from the church to the reception. There we were in our fancy dresses, tuxes, and of course, the bride in white with her puffy veil streaming in the wind, peering out of the windows at the local tourists. Boy, did we get a lot of honks! Much more memorable than your usual limo ride. It's a fun way to see the resort are and it sure beats having to find parking near the boardwalk! Atlantic Ave., the Virginia Aquarium, First Landing State Park, Ocean Breeze Water Park, the KOA campgrounds on General Booth Blvd, the Holiday Trav-L-Park, Shore Drive restaurants, and the North End beaches. 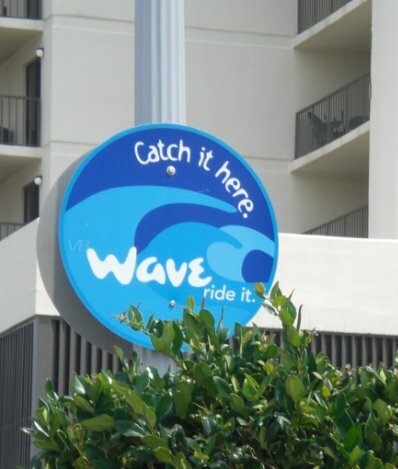 Catch the "Wave" - the Virginia Beach Trolley for a quick way to get around the resort area. Travels the length of the boardwalk and back, with stops along the way. If you want to go to First Landing State Park, transfer to HRT Bus Route 33 at 40th Street. Hours-- Daily, May 1 – Sept. 30, 8 am - 2 am about every 15 minutes. Starts at the bottom of the Boardwalk and goes south to the Virginia Aquarium, the KOA campground, the Holiday Trav-L-Park Campground, and the Ocean Breeze Waterpark. Hours-- Daily, May 23 – Labor Day, 8 am - 2 am, about every 20 minutes. Starts at the bottom of the Boardwalk and travels north and west to stop at the trendy Hilltop area and Lynnhaven Mall. Hours-- Daily, May 23 – Labor Day, 9 am - 11 pm, about every hour. The Wave only operates May through October (but it can be rented for private use-- like for wedding parties!-- during the off-season. 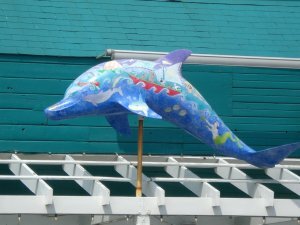 While riding the Virginia Beach Trolley, be on the lookout for dolphins! For a list of locations to buy fare cards, plus a map of the route, click here. For more information on the Wave, go to www.vbwave.com - 757-222-6100. The HRT (Hampton Roads Transit), which runs the Wave, also operates the Paddlewheel Ferry, another slice of nostalgia, which takes you from Portsmouth to Norfolk and back. For more information on the Paddlewheel Ferry, as well as tours of the Norfolk Naval Station, go to www.gohrt.com. There are SO many fantastic things to do in and around the beach. Check out these links for more great activities and tips for Virginia Beach! How to Plan the Perfect Virginia Beach Vacation! Have a great time in Virginia Beach!